A.R. Gurney's Love Letters chronicles the relationship between a man and a woman solely through their correspondence. The play tells the story of Andrew Makepeace Ladd and Melissa Gardner, whose poignantly funny friendship and ill-fated romance takes them from second grade through adolescence, maturity, and into middle age. 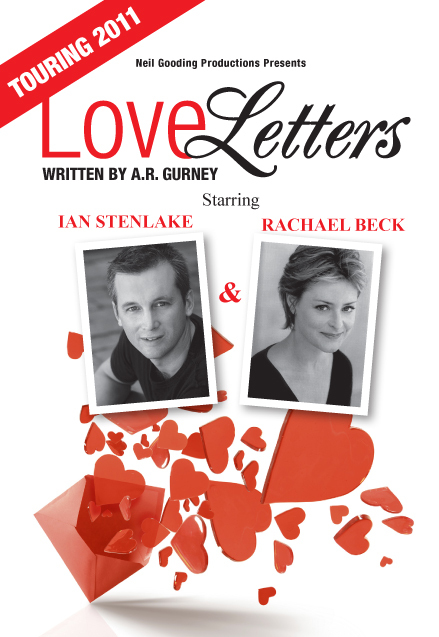 Love Letters stars two of Australia's favourite performers from the stage and screen – the husband and wife pairing of Ian Stenlake (Sea Patrol, Guys n Dolls) and Rachael Beck (It Takes Two, Hey Dad, Beauty & The Beast), with direction by Neil Gooding (Gutenberg! The Musical!, LOVEBiTES). A smash hit both off and on Broadway as well as in London, Love Letters captures Andy and Melissa with a precision of detail and depth of feeling only Gurney can command. To date the show has played seasons Whitehorse in Melbourne, Geelong, Perth, Mandurah and Bunbury in February and March 2011.